4 Bedroom Detached House For Sale in Cheltenham for Guide Price £595,000. 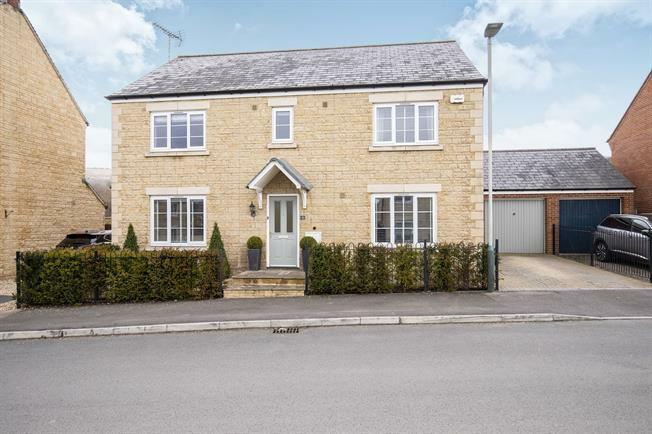 This immaculate family home was originally the show home and offers substantial family living. The property comprises of entrance hall, sitting room with double doors to the dining room which accesses the conservatory and the kitchen. The kitchen has been recently refitted and has an island and integrated appliances. There is also a WC, utility room and study to the ground floor. The first floor has four double bedrooms with two of them having en-suite shower rooms and all of them having built in wardrobes. The family bathroom has a bath and a separate shower. The property further benefits from double glazing, gas central heating, driveway parking, tandem garage with light and power and a secure rear garden with views to the hills. Range of base and eye level units, an island with built in wine cooler, integrated fridge freezer, dishwasher, two ovens with microwave and grill, electric hob with extractor over. Space for dining table and double doors to the conservatory. Space and plumbing for washing machine and door to the side. Low level WC, hand wash basin, shower cubicle and hand wash basin.